Ultrasonic jewelry cleaners are capable of making dull and grimy jewelry look pristine, polished, and sometimes even like brand new. Ultrasonic cleaners utilize a process of sonically induced controlled air implosion called cavitation. Cavitation bubbles remove unwanted materials safely from all manner of items making ultrasonic cleaning a fantastic choice for earrings, necklaces, rings, bracelets, and other small items with hard to reach crevices. We’ve taken hours to research ultrasonic jewelry cleaners, their specifications, and much, much more. This ultrasonic jewelry cleaner is fast, efficient, and gentle. It also has UV technology which completely disinfects all manner of small items. It can be used not only for jewelry but also for small things like mouth guards or baby products. For jewelry, you just add your favorite ultrasonic jewelry cleaning solution and you’re all set. It also kills 99.9% of all viruses. You can independently control its UV-C settings as well. It can be programmed through a set of simple ultrasonic settings making it a versatile and flexible choice. All of its settings have been automatically pre-programmed so you can trust that the machine will shut off when cleaning is complete. Use it for jewelry like necklaces, bracelets, rings, or earrings. If you need to sanitize hygiene items like toothbrushes, combs, dentures, or razors, this product is also a great choice. On the downside, this ultrasonic cleaner is a bit more expensive than many similar options. It also can not be used to clean silver jewelry that’s oxidized or tarnished. Alternatively, you should not clean precious stones like agate, turquoise, or opals. That being said, this is an efficient and dependable cleaner that has many useful purposes. Versatile – This machine can clean all manner of small items. UV technology – The UV-C components of this machine sanitize and disinfect your items, killing 99.9% of bacteria and even viruses. Easy to use – The automatic shut off settings and independently controls make this an easy product to use. Can not clean everything – There are some items that you can not clean with this device. More expensive – This product is more expensive than many similar options. Verdict: If you are looking for a machine to quickly clean your jewelry but also may need to disinfect small items, this is a great product to consider purchasing. It’s efficient, easy to use, and has UV technology that kills bacteria and viruses effectively. It also has independent settings so you can control its levels and UV settings effortlessly. On the other hand, it’s a bit pricier than many similar options and it can not be used to clean certain items. Still, if you need a versatile and dependable ultrasonic cleaner, the InvisiClean would be a good choice. We consider the Invisiclean UVC to be the best ultrasonic cleaner for jewelry, as well as the most efficient product on our list. This is another impressive InvisiClean product that functions very efficiently. It features dual transducers that remove dirt, grime, and other debris powerfully. It functions as two machines in one. You can professionally clean diamonds, gold, and other precious materials without causing damage. It can also be used for eyeglasses, sunglasses, dentures, cosmetic application products, and coins. It’s compact and easy to use, with simple to understand settings and an included basket holder. Similar to other InvisiClean products, this machine can not be used for silver or certain precious stones. One of the things we like about this ultrasonic cleaner is its price. 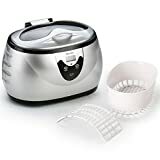 It has all of the power that you’d get from a professional ultrasonic jewelry cleaner for a price that you can afford. It differs from other ultrasonic cleaners in the InvisiClean lineup in that it does not feature UV cleaning technology. This means that it can not disinfect some items. However, it does clean jewelry well. It’s powerful, well-made, and comes at a fair price. Dual transducers – This machine functions as a two in one option with powerful transducers. Versatile – You can use this machine not only for jewels but also for other small and delicate items that require powerful yet gentle cleaning. Better value – Compared to other InvisiClean products, this machine is a better value. Easy to use – With an included cleaning basket and in-depth instruction manual, this product is easy to use and understand. No UV cleaning – This machine cannot be used to sanitize and kill viruses on small items. Basket limits effectiveness – The included basket tends to limit the effectiveness of this ultrasonic cleaner. Verdict: If you need a powerful ultrasonic cleaner that operates at a professional level, this would be a good option to consider. It’s fast, efficient, and can remove years of dirt and grime from many different types of small items. On the downside, it isn’t as efficient when you use it with the basket that it comes with. this means that necklaces, earrings, and other tiny items may take longer to clean. That being said, we like how effective it is and it comes at a lower price than many other professional ultrasonic jewelry cleaning devices. If your wedding ring has been looking dull or dingy and you don’t really want to make a trip to the jeweler to have it professionally cleaned, this product may be well worth considering. It can be used reliably for years and years to clean rings, bracelets, watches, coins, dentures, razor blades, and much more. It has an easy to read digital display that comes with eighteen cycle working modes. It also can be set on multiple levels so that you’ll get the cleaning power you need without going overboard and damaging your valuables. The Onezili 800ml ultrasonic cleaning device comes with a year of customer service and has been made with durable materials like #304 stainless steel. It has upgraded performance so you really do get more bang for your buck. With this product, you get the ultrasonic cleaner, a power cable, and an instruction manual. It’s a fantastic option for novices who want to get their jewelry cleaned but aren’t sure how to do so without spending lots of money or damaging items. On the downside, it’s more expensive than many other ultrasonic cleaners. It also may have some functionality issues after the first year. Stainless steel – the stainless steel construction makes this a durable and easy to clean option. Great for many items – This machine is powerful enough to clean jewelry but also gentle enough to be used on eyeglasses and other delicate items. Amazing results – After one use, you’ll have visibly cleaner jewelry. More expensive – you’ll be paying a bit more for the solid construction of this machine. May have functionality issues – There have been reports that this machine tends to wear out if used constantly. Verdict: If you have been looking for a way to clean items occasionally with minimal effort, this may be a good choice. It’s very easy to understand and is awesome for wedding rings and other items that tend to lose their sheen. On the other hand, it will wear out if you use it constantly and also is a bit more expensive than some similar options because of its stainless steel construction. Still, for the occasional cleaning of small valuables, this is a great option. Here’s an ultrasonic cleaner that can be used by pretty much anyone. It has a simple and easy to understand design that even the most novice jewelry owner can comprehend. It literally has three buttons that let you control your jewelry cleaning settings. The Tacklife ultrasonic cleaner can be used on delicate items and small metal articles. It cleans eyeglasses, watches, jewelry, utensils, and much more. You can also use this machine with regular tap water. It includes everything you need to get started and comes with a basket that will keep your valuables safe as it operates. The powerful ultrasonic waves remove dirt, dust, grime, and many different kinds of stains. It can also be used for things like printer heads, screws, stationary and writing utensils, and toothbrushes. We recommend using this ultrasonic jewelry cleaner with some kind of cleaning solution for jewelry. This will help it to clean items faster and more efficiently. It also doesn’t have a very efficient preset timer, which means it must be monitored. You may have to clean things on two or three preset cycles. Other than that, however, this is a simple and effective small item cleaning machine that utilizes gentle yet powerful ultrasonic waves to get the job done. Simple design – There are only three buttons on the entire machine making it pretty simple to understand. Includes basket – This device comes with an included small item basket so you can clean even the tiniest items easily. Great for stationary – You can use this device to effectively clean stationery items like ink tips and rubber stamps. The timer is frustrating – The preset timer on this device shuts it off quickly, you may have to put it through multiple cycles to get some items clean. 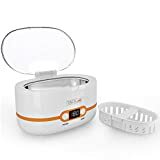 Verdict: If you have been looking for a simple and effective ultrasonic jewelry cleaner that can also be used for stationery items, this product may be worth a look. It has a minimalistic interface that only requires you to learn three buttons. Its main disadvantage is that it shuts off automatically because of its preset timer. You’ll have to put it through a few cycles to get items all of the way clean. If you can deal with that, this is a good option to consider. This is a compact and easy to use ultrasonic cleaning device. You’ll be able to focus on cleaning your small items more, and learning how to operate this machine less. It comes at a great price and can be used for many different small items. The ultrasonic cleaning cavitation bubbles do a great job of removing debris. This ultrasonic cleaner creates very efficient little waves to help remove all kinds of debris as well. This ultrasonic cleaner makes the cavitation bubbles vibrate to agitate the liquid surrounding them so contaminants are destroyed and filtered away. This makes for fast and efficient cleaning with less energy and aggravation on your part. You won’t have to scrub and scrub jewelry in the sink anymore. This machine does it all for you. It has a removable basket and automatic shut off features for your convenience. You can place rings, necklaces, earrings and more in the safety basket to ensure that they don’t get damaged or lost. It also can be used with many different household cleaners. It can even be used with dish soap, though many other ultrasonic cleaners can say this as well. It features five different cycles so that you can select the specified cycles that you prefer to match the items you’re cleaning. These five different timed cycles can be selected using an easy to understand menu with a bright digital interface. The only downside is that this machine is pretty simplistic. It doesn’t have anything particularly impressive or any “wow” factors. It’s also a bit more expensive than some other machines that give you a tad more power. Five timed cycles – Choose from five different cycles so that you can get the exact amount of cleaning that you need. Durable – This machine comes with a two-year warranty; you’ll have peace of mind knowing that it will last and last. Wide application – This machine can be used for all different kinds of small items like jewelry, small metal instruments, and more. Medium-range value – The simple design and lack of impressive extras makes this a medium range value. Verdict: If you want a simple and easy to understand jewelry cleaner that won’t let you down, this is a great option. It lets you choose from five different timed cycles and can be used for many different kinds of jewelry or for other small items. The only drawback is that for the price, we would like to see some extra features or perhaps a bit more power. Still, if you need a simple and reliable jewelry cleaner, this would be a good option. The best part about this ultrasonic jewelry cleaner is probably its portable design. You can literally take it anywhere you go. It’s powerful, efficient, and lightweight. Ultrasonic waves use bubbles to quickly and gently remove dirt and grime from tiny items. It’s powerful enough to clean even the grimiest items yet gentle enough not to damage them. The Ukoke cleaner also is pretty lightweight. It is actually one of the lightest and most durable ultrasonic jewelry cleaners out there. The ukoke cleaning machine can be taken on the road without much of a problem. All of its components can be easily stored right inside of the machine. It also includes all of the baskets and accessories that you need to clean tiny jewelry. It has been created with expert electronic expertise so that it will last for years to come. This one also boasts an impressive 42,000 Hz of ultrasonic sound wave power. This means that it can clean dirtier items faster than many of its competitors. It has a powerful degas function as well. That’s very likely one of the most impressive parts of this machine. The Degas function offers users supreme cleaning performance by removing gas from pressurized water. Pretty much any water that you get out of the tap contains gasses that have been pressurized. These gasses are not conducive to optimal cleaning power when they get into an ultrasonic machine. The Ukoke UUC06S completely eliminates this problem. While some other ultrasonic cleaners have degassing functions, this particular model completely eliminates gasses making it safe to use with any kind of tap water. This is a good thing too because when you’re traveling, you can’t be sure what’s in your water. You can use it in a hotel room, for instance. Just plug it in, put some sink water in it, and let it clean your jewelry so that you can enjoy yourself more. It also has touch controls and a full one-year warranty for your peace of mind. The only downside of this product is its vibration. It tends to vibrate a bit when in operation which may get annoying to some users. Other than that though, this is an amazing option for anyone who travels frequently or simply wants a compact and reliable jewelry cleaning solution. Portable – Very easy to carry with you as you travel. Lightweight – The lightweight and compact design of this device are awesome. Touch controls – Simple to use touch control settings make this ultrasonic cleaner that much simpler to operate. Warranty – This ultrasonic jewelry cleaner comes with a one-year warranty. Vibrates a bit – When you’re using it, you may notice that this machine tends to vibrate a bit. 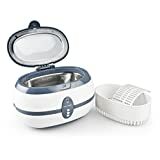 Verdict: If you have been looking for a versatile and portable ultrasonic cleaner that can be used for almost all of your jewelry, this is a fantastic option. It is easy to operate, portable, and reliable. It also can be used with any kind of water so there’s less hassle for you. The only downside to owning this machine is that it is a bit noisier than some other ultrasonic cleaners. This is our pick for the best value when it comes to ultrasonic cleaning devices. This is because it does a great job of balancing price, utility, design, and operation. It features a very simple design with many helpful user features. It’s really great for commercial or home use. It’s efficient and small. This dual-wave ultrasonic cleaner will ensure that your items work and sparkle like new. Even though it isn’t very large in size, it features a spacious tank that lets you clean many items at once. You can get professional results even if you have never cleaned your jewelry with an ultrasonic cleaning device before. It has mechanical components that give it 42,000 Hz dual-wave ultrasonic technology. The spacious 28 oz. stainless steel reservoir on the inside of this machine is also easy to clean and service. his is a heavy duty cleaner that will last for years. you can trust that it can be relied on to clean the same rings and precious stones over and over again. This machine does a great job of utilizing ultrasonic waves to clean gold as well. It’s pretty energy efficient and lets you select the settings that you prefer to use. It comes with everything that you need to get started including a cleaning basket, detailed instrument manual, and a lifetime of customer support. For those reasons, we feel like this is definitely the best value when it comes to at-home ultrasonic cleaners. Best value – This item balances utility, design, function, efficiency, and price, very well. Durable – Stainless steel and other durable materials have been used in the construction of this ultrasonic cleaner. Lifetime support – You not only get a detailed instrument user manual, but you also will get a lifetime of customer support with this cleaner. 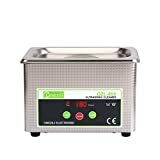 Ideal for all types of items – This ultrasonic cleaner can be used with many different kinds of items including jewelry, glasses, tiny instruments, and more. Small – This ultrasonic cleaner is a bit smaller than many similar devices. Verdict: if you have been looking for an ultrasonic cleaner that comes at a great price, this is a good option. It’s s great value because it’s not only reliable but also efficient. It is easy to use and operate, and even include lifetime customer care. All in all, it’s a good choice for anyone wanting to clean their jewelry at home. Its only downside is that it’s a bit smaller than many other cleaners. Still, for the price, it makes a great option for many people. This ultrasonic cleaner is the least expensive option on our list. It’s just as powerful as most other ultrasonic cleaners in its price range and can be used for many different kinds of jewelry. It comes with a cleaning basket and everything that most people require to get started cleaning their small items. On the other hand, it isn’t of the highest quality. You may find that this machine is somewhat noisy. Additionally, it can not be used to clean very small items, like necklace chains, without them slipping through the rungs of the basket. This can be frustrating for users who want to clean earrings and necklaces. It also may not last a lifetime. Still, it’s pretty energy efficient and comes at a great price. The ultrasonic wave technology isn’t bad either. For what you get, we feel like its a good option. It’s a lot better than any of the other cheap ultrasonic cleaners out there. On top of all of that, it comes with a warranty. While the quality isn’t in any way premium, it’s still a durable option. All around, this machine would be a great backup or would be a good choice for users looking to only clean jewels occasionally. It’s definitely the least expensive option that we have seen so far that’s still of good enough quality to get most jobs done well. Inexpensive – this is a great option for anyone looking to save money cleaning their jewelry. Efficient – This is an energy efficient option that can get a job done well enough. Comes with warranty – This ultrasonic cleaner includes a warranty and a 6p day money back guarantee. Not the best quality – This isn’t a premium or professional machine by any means. Basket holes are too wide – The holes in the basket let small items like earrings and necklace chains slip right through. Verdict: If you need something inexpensive for occasional cleaning, this is your best bet. It cleans jewelry pretty well and is very efficient. That being said, it isn’t in any way a premium option and the basket holes are too wide for some items. Still, for the price, it’s a better option than most other inexpensive ultrasonic jewelry cleaners. A good choice to have for many people who only need to occasionally clean their jewelry. What ultrasonic cleaning solution do you recommend, is it mandatory to use? There are many ultrasonic cleaning solutions that can be used to get your jewelry looking like its brand new. The Blitz Gem & Jewelry Cleaning solution is our favorite. You can also use dishwashing liquid and other non-residual soaps with your ultrasonic cleaner. Some people choose to simply use ammonia and water. Opinions vastly differ on what the best ultrasonic jewelry cleaning solutions really are. If you choose not to use a soap or cleaning solution, your ultrasonic cleaner may take longer to adequately remove residue from items. Additionally, they may not look as shiny and “polished” after you clean them. That being said, it is not mandatory to use cleaning solutions with many ultrasonic cleaners. Which one is the most portable? 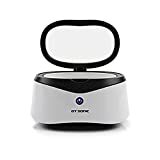 If you travel frequently and have been trying to figure out how you’ll keep your jewelry looking polished and pristine wherever you go, a portable ultrasonic jewelry cleaner may be the ideal solution. The Ukoke UUC06S Ultrasonic Cleaner is hands down the most portable ultrasonic jewelry cleaner on our list. It can be used with any tap water as well, which is an important aspect to consider when you are on-the-go. The touch control panel makes it easy to use as well. I’m wondering if I can build a DIY ultrasonic cleaner? While building an ultrasonic cleaner of your own may not be impossible to do yourself, it would take a good bit of technical knowledge and scientific expertise. The cavitation process that an ultrasonic cleaner utilizes is a complex one. This means that any pressure and vibration put out by the device you create must be balanced properly. Simply shaking your jewelry around in a base of water won’t remove debris from the crevices of intricate items. Ultrasonic cleaners aren’t like tiny washing machines that just shake everything around in a tub. They use sound waves to agitate the water and create pressurized bubbles which implode. This is gentle on delicate items and tough on debris. Heat and pressure also come in to play and may impact the cleaning abilities of any device you create. Essentially, if you try to build your own ultrasonic jewelry cleaner but you don’t have years of scientific and/ or technical industrial knowledge, you’ll probably end up with many parts cobbled together in a way that will not clean your jewelry very well. It would be much more cost effective to just buy an ultrasonic cleaner at a low price. That being said, there are a few ways that you can make a DIY ultrasonic cleaner. If you really want to make your own ultrasonic cleaner, there is a way to do it with a coffee can. Here is a link that can show you how to do that. Are there any types of jewelry that cannot be cleaned with these devices? Knowing what you should and should not put in your ultrasonic cleaner is critical. After all, damaging your valuables is pretty much the opposite of cleaning and caring for them. While ultrasonic devices can work wonders on most precious metals, there are a few things that really should not be put into any kind of ultrasonic jewelry cleaner. Please keep in mind, all ultrasonic cleaners have not been created equally. Ultrasonic jewelry cleaners are designed specifically for jewelry and are not to be confused with general ultrasonic cleaning devices. An ultrasonic cleaner that was made for cleaning carburetors, for instance, will eat pretty much any kind of jewelry alive. 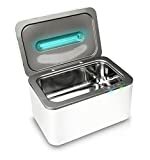 You should only ever put your jewelry into ultrasonic cleaners that have been specifically designated to remove unwanted buildup from small delicate items. There are also many types of high-end jewelry cleaning devices that can gently clean delicate jewelry without damaging it at all. There are even a few ultrasonic jewelry cleaners that specifically cater to easily damaged items. Also, you will need to be sure you are using your ultrasonic jewelry cleaner the right way. Using your ultrasonic cleaner correctly will help you avoid damaging your jewelry in general. For the purposes of answering this question, we will talk about regular, mid-tier, ultrasonic cleaning devices. Below, we have listed a few things that you should probably avoid putting into these types of ultrasonic cleaners. Anything that’s broken, loose, or seems to be in particularly poor condition should generally not be put into an ultrasonic cleaner. The reason for this is that broken or loose stones may be damaged even further by the motion of the water and the pressure from cavitation. There are also a few gems that should probably not be cleaned with an ultrasonic device. Mainly, we are referring to very delicate types of naturally occurring stones. This is because the same cavitation process that gets rid of dirt and grime may actually start to remove the outer layers and certain natural minerals or even crack brittle stones. Many types of natural pearls, for instance, may become damaged or fractured if cleaned to intensely. The main type of gemstone to avoid putting into your ultrasonic cleaner would have to be the opal. Anyone who knows this stone well also knows that it shouldn’t be put under heavy pressure. Opals are formed naturally and can develop both visible and microscopic faults. These little faults can extend throughout the entirety of the gem. The natural faults that make opals so unique are also prone to disruption and breakage under the pressure. If you have opals that need to be cleaned, your jeweler can help you decide what the best cleaning method is based on the stone itself. If you have other jewelry that you need to have cleaned but are unsure if it can be placed into an ultrasonic cleaning device, don’t stress. There are a few things that you can do to find out what your next step should be. For one, you can read your devices instruction manual. This may seem a bit too obvious, but there are many different levels that an ultrasonic cleaner can work on. Some cleaners may be suitable for delicate items while others are simply tough on grime. Reference your user instructions and see if there’s a list of materials that may or may not be cleaned safely. You can also ask your jeweler. Keep in mind that some jewelry distributors will probably just recommend that you pay them to clean all your items. Still, if you think you can trust your local jeweler to give you a fair and objective opinion, ask away. Finally, you can check out this guide with a general overview of what you can and cannot clean in your ultrasonic jewelry cleaner. How does ultrasonic cleaning actually work? If you’ve been considering purchasing an ultrasonic jewelry cleaner, you’ll probably want to understand how these devices work. Ultrasonic cleaners utilize the power of the bubble, lots of bubbles, actually. These cleaning bubbles are generated by low-frequency sound waves. This process is known as cavitation, the formation of a cavity. Ultrasonic bubbles are surprisingly powerful and efficient. The process of cavitation creates bubbles that are in an unstable form, meaning they collapse rapidly. The rapid closure of each bubble, sometimes millions of bubbles per second, creates pressure and heat, which removes dirt, stains, and debris from an object. That’s why ultrasonic and cavitation technology is so great for jewelry. The thousands and sometimes millions of tiny bubbles clean very efficiently and gently. The ultrasonic sound waves are also generated efficiently, making ultrasonic jewelry cleaners a fairly energy efficient option. With an ultrasonic jewelry cleaner, you’ll be able to remove more unwanted material more rapidly and with less effort. To really understand how ultrasonic cleaning works, it may be a good idea to take a look at the process of cavitation. Here’s an article from Wikipedia.com that can give you a better overview of ultrasonic cleaning and what it can do. There are a few other important things to know about how ultrasonic cleaners work. Even though ultrasonic cleaning is very effective, for cleaning jewelry, you should also use some kind of solvent. This will speed up the cleaning process. Ultrasonic cleaners are also pretty fast. Most ultrasonic jewelry cleaners can remove dirt and grime in only three minutes. Ultrasonic cleaning does not always disinfect everything. That’s why an ultrasonic cleaner with UV technology will be best for people who wish to clean and disinfect small items. Essentially, ultrasonic cleaning utilizes science and cavitation to efficiently clean any number of items. It’s a quick and efficient way of removing an array of substances from your jewelry. Soundwaves create cavitation bubbles which pop rapidly, causing heat and pressure that’s tough on dirt, grime, and debris. Ultrasonic cleaning should not be used for certain materials. It also does not always disinfect everything. However, if you wish to efficiently clean your jewelry quickly and easily, ultrasonic cleaning is probably the best way to accomplish this. 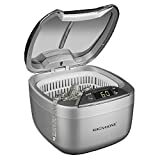 Hopefully, now that you’ve seen a few fantastic ultrasonic jewelry cleaner options and read over some of the most frequently asked questions about these devices, you feel more confident in your shopping process. We’d love to hear your feedback! Are we missing any particularly impressive products on our top products list? Are there any important questions about these jewelry cleaners that we have yet to answer? Do you have another pick for the best ultrasonic cleaner for jewelry? Please feel free to leave your comments and let us know!